In this chapter, Thomas F. Luschei and Michelle Soto-Peña report the results of a comprehensive review of literature related to the influence of Colombia’s Escuela Nueva rural school improvement model in Colombia and beyond. Using a critical theoretical lens drawing on the work of Paulo Freire, they discuss evidence of Escuela Nueva’s impact on the development of non-cognitive skills, including the creation of active citizens. Most importantly, they explore the questions of whether and how Escuela Nueva promotes active and involved participation in personal relationships, civic activities and attitudes, and peaceful social relations. 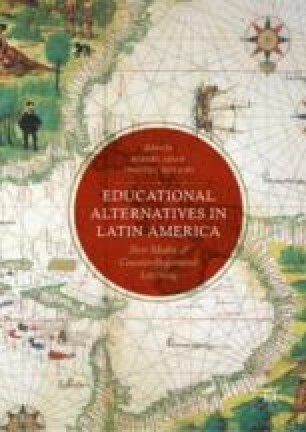 The authors argue that the widespread application of Escuela Nueva since the 1970s has positively influenced social and political transformation in Colombia. Madhavan, R. (2015). Cooperative learning in Escuela Nueva Activa. Retrieved from http://escuelanueva.org/portal1/images/PDF/CooperativeLearninginEscuelaNueva.pdf. O’Connell, S. D. S. (2014). PRODEGE: Policy transfer to spark educational change in Equatorial Guinea. Doctoral dissertation, University of Maryland. Retrieved from http://drum.lib.umd.edu/handle/1903/15273. Rüst, M. (2012). Peace education in Escuela Nueva: Peace is not taught; it is learned together. Retrieved from http://escuelanueva.org/portal1/images/PDF/PeaceEducationinEscuelaNueva.pdf.